When it comes to critical success, Wonder Woman is the unrivaled champion of the DC Extended Universe (DCEU). Fans and critics alike absolutely loved Gal Gadot's take on Diana Prince in the solo film, and director Patty Jenkins nailed the tone. The film, however, opens up some major questions about the origins of the DCEU. None of it is enough to derail a fantastic film, but still, there are a few dumb things that linger. In establishing the world of Themyscira, the film throws back to the time of ancient mythological gods. We learn that Zeus created the Amazons, and we're told he also made mankind itself. Now, that's not a huge surprise—this film is positively steeped in Greek mythology. But later we learn that these ancient gods actually existed, and we literally meet the Greek god of war, Ares. So does that mean the Greek gods are the actual gods of the DCEU, who created mankind within the DCEU? The existence of Zeus is presented as fact, along with his accomplishments and creations. It's never really referenced much beyond the film's intro, but if this is all one universe, it would mean Zeus is real and created man. It's a fascinating thought exercise and a quick reminder of how much every little detail counts in a connected universe. Heck, Marvel recently had to have a villain call the Infinity Gauntlet in Odin's vault a fake in Thor: Ragnarok just to retcon itself out of an off-hand Easter egg from years ago. Where'd the German fleet go? Diana's life is torn apart when a scouting party of German soldiers follow Steve Trevor through Themyscira's invisibility shield, and they all land smack dab on the Amazons' doorstep. So why didn't the rest of that German fleet keep going to see what happened? We see those initial scouts land on the beach and battle the Amazons, eventually being overpowered. But what about the several other German ships and soldiers just outside of the cloak? From their end, they must've wondered what happened to their disappearing scouting parties. Why not push forward to find their soldiers? What happened to those boats? Did they all just turn away and run? Wouldn't the discovery of the barrier be huge for the Germans? Some type of mystical invisibility tech could certainly be of interest in the middle of a war, right? Instead, just a dozen or so soldiers show up, and the rest simply give up the pursuit and never bother to discover Themyscira. Those Amazons sure are lucky. Diana is extremely powerful and has been trained by the greatest Amazon warriors. We see she is clearly fast enough to move and deflect bullets with her bracelets, which makes sense. After all, she's Wonder Woman. 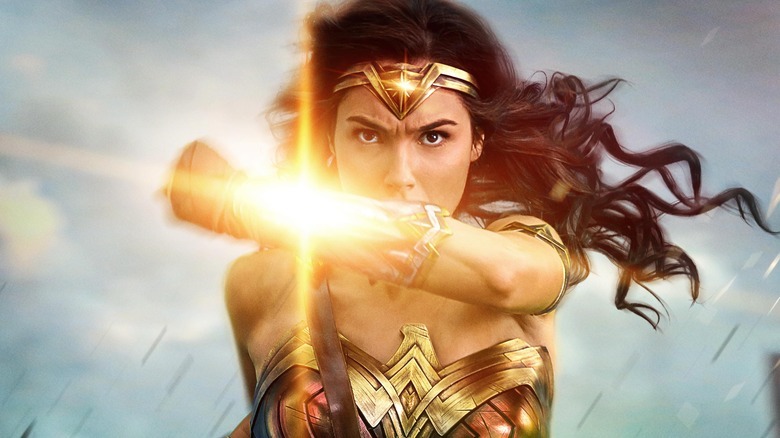 Director Patty Jenkins, however, explained the big screen Wonder Woman is "not bulletproof but she's not easily killed." If she ever is shot, she "heals very quickly," but she can be killed. For the sake of reference, it sounds like a more powerful take on how Captain America's abilities are portrayed in the Marvel Cinematic Universe. Knowing that, there's one scene in Wonder Woman that arguably pushes things too far. When Wonder Woman and her team head to the front, she heroically heads into No Man's Land to draw the fire of enemy forces. It's one of the film's most inspiring, action-packed, and simply awesome scenes. But, if Wonder Woman isn't bulletproof, how exactly did she manage to avoid literally every bullet? You had multiple machine guns and dozens of soldiers unloading on Diana, who is standing right in the middle of open space. Yes, her shield absorbs the brunt of the bullets, and she's obviously capable of deflecting a few with her wrist bands, but her legs were almost completely exposed as she approached the enemy trench. So not one bullet managed to make contact? That's extremely lucky, to put it mildly. Yes, the majority of the Earth is covered in water—and there's a lot of it out there. As such, the odds of randomly stumbling upon a hidden island behind a cloak of invisibility are relatively low, but the island of Themyscira is apparently not all that far from England, at least judging by Steve and Diana's trip there. We see Steve and Diana depart Themyscira on a relatively small boat and seemingly make it to England within a day or so. Earlier, we see from Diana's response to meeting Steve, that she's never met a man before, and we know she's at least around 600 years old at this point, so it stands to reason this is the first time anyone has found the Amazons' island paradise. If the island is that close to the U.K., and Europe for that matter, how did no one ever accidentally sail through the invisibility bubble? We're told, repeatedly, that Steve Trevor isn't your average guy. He's an ace spy who becomes a major project for the Germans, and strolls out of a German base with Doctor Poison's prized notebook and is so recognizable that a few German thugs track him down in the streets of London to try and reacquire it. Fast forward a bit, though, and Steve is able to stroll right into a high-level German officers' gala and even chat up Doctor Poison, who's none the wiser. So how is Trevor recognizable enough to get spotted on a street in London, but not while walking around right in the middle of a German event after he's already stolen state secrets and made it out relatively unscathed (with the help of some Amazons, but still)? With Wonder Woman making her debut in Batman v Superman: Dawn of Justice, we got an abridged version of her story to set the stage for her solo film. One plot point woven into Batman v Superman was the idea that Diana had basically given up on fighting for humanity and was living her life off the radar. That doesn't jibe with the character we meet in Wonder Woman. At all. Gal Gadot said as much herself in a recent interview, noting she regrets that decision and believes they got it wrong. Gadot said that, in making Wonder Woman, they realized there is "no way that Wonder Woman will ever give up on mankind. She went on to explain that "sometimes, in a creative process, you establish something that is not necessarily the right decision, but then you can always correct it and change it." They tried to make a course correction to that point in the recent Justice League, with Bruce Wayne calling out Diana for her down time in the wake of Steve Trevor's death. She shoves Bruce across the room, but that's pretty much the only acknowledgement we get of her missing years. A major plot point focuses on the extremely deadly poison gas Doctor Poison engineers and tests on a village Wonder Woman had liberated just days earlier. We get to see the gas in action when Wonder Woman runs through it to check the village, and Steve has to stop at the border before inhaling it. The gas itself is at issue here. It behaves a bit strangely: It's a thick, yellow fog that basically halts at the border of the village and doesn't really dissipate. It behaves, basically, by movie rules of poison gas to make it look cool. But hey, lucky for Steve, he can stand right beside the gas and not be affected. The entire story of Ares is one of the most confusing elements of Wonder Woman. It serves as a mirror into Diana's naiveté, since she believes man is inherently good and it must be Ares' influence that is driving The Great War. She later comes to realize that some men are just evil, no Greek god of war required—and then the actual god of war shows up. So he apparently just helps manipulate actions? But men are still kind of bad anyway? We're told Ares has been on the run ever since the epic battle of the gods when Zeus managed to cast him out. But not even the mighty Zeus—the god who apparently has enough power to create mankind itself—can take out Ares. So how does Diana have the juice to slay a god? Yes, she has a weapon that was left behind to handle Ares should he ever rise up again, and she is part god, but still, it's a tall order. Tasking Diana with taking out a literal old-school god, something other all-powerful gods have failed at before, and on her first trip into the outside world? That's pretty heady. What's even more impressive is that she pulled it off.